Some insects go through a complete metamorphosis, changing from one form into another over the course of their lives. Many of these insects enter this transformational stage inside what is known as a cocoon. After finishing the embryonic stage, the young insect goes into the pupa stage when it builds a cocoon for itself and finishes the transformation inside the protection of the cocoon. For many insects, this metamorphosis happens underground. The hummingbird moth is so named because of its ability to hover in front of a flower with fast-beating wings and sip the nectar from the flower. The quick movement of the wings makes a humming sound, much like the hummingbird. During the pupa stage the hummingbird moth caterpillar, called a hornworm because of a menacing-looking barb on its rear, spins a cocoon underground. The caterpillar digs a shallow protective pit in the soil in the autumn before emerging as an adult hummingbird moth in the spring. This moth is also known as a sphinx moth or the death’s head sphinx. The name nocutid moth may refer to several species of moths in the Noctuidae family of insects. These include clothes moths, leaf miners, plume moths and silk moths. 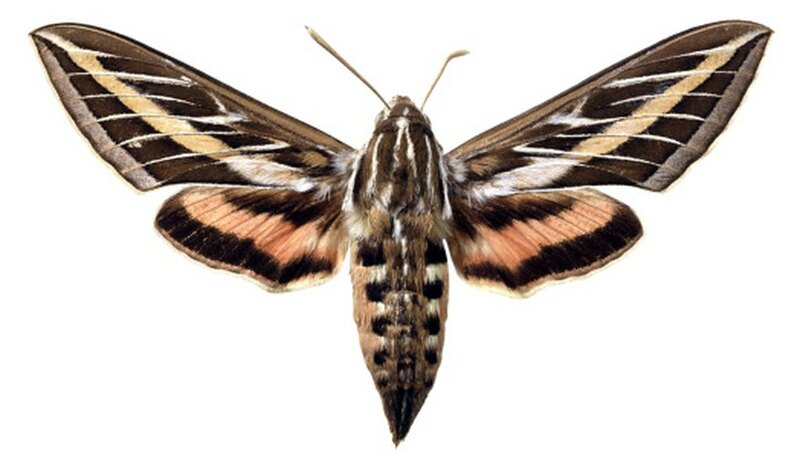 They are also related to the sphinx moth. Like other moths, the nocutid begins as a caterpillar, then spins a cocoon. The pupa stage generally takes place underground with some exceptions depending on the specific species or area where they live. The nocutids are identified easily by antennae that resemble bat ears that are very sensitive to pheromones in the night air, which is how they find mates. The gardenia bee hawkmoth has a very descriptive name. These bright green and yellow diurnal moths are often seen hovering around gardenias, where they also lay eggs, and other sweet-smelling flowers where they sip the nectar for food. The bee-like clear wings and an ability to swoop around like a hawk also contribute to its rather long name. This remarkable moth comes from an equally remarkable caterpillar. The gardenia bee hawk caterpillar is usually black with white spirals or mostly green with a gray back and some red-rimmed white markings. This caterpillar makes its way underground to spin a cocoon before emerging as an adult moth. While most people associate cocoons with moths, there are other insects that use cocoons during the pupa stage. Many beetles, including the stag beetle, spin a cocoon underground. The stag beetle lives underground during the larval stage, where it feeds on rotting wood. It may remain in the larval stage for up to six years. The larva then spins an underground cocoon in the autumn and becomes an adult beetle in the spring. It only lives a few weeks as an adult because the adult stag beetle does not eat. It only mates and then dies.